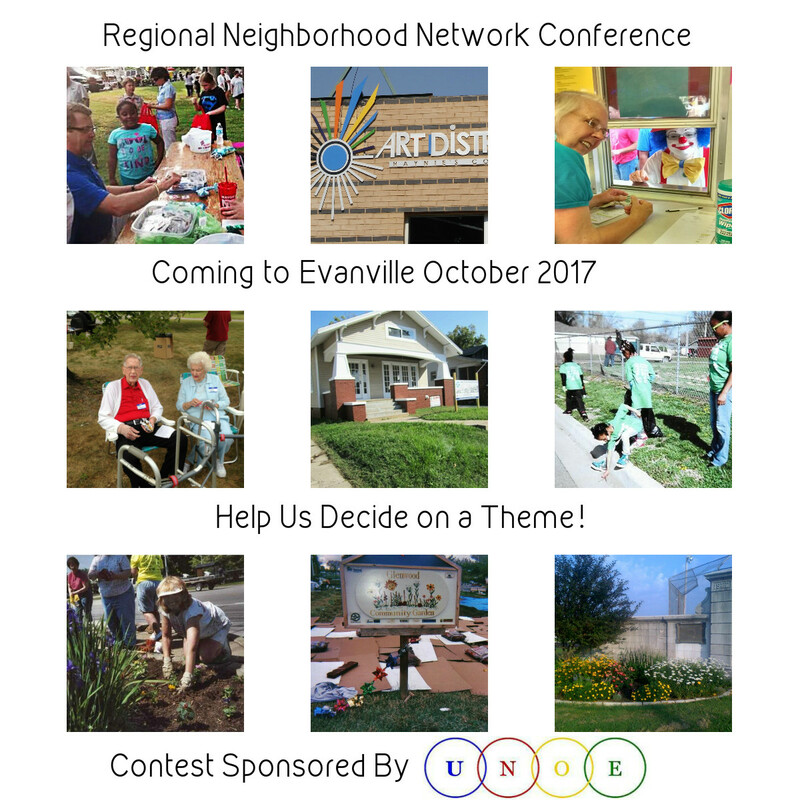 The next United Neighborhoods of Evansville General Membership Meeting will be on Thursday, June 23rd 2016 at 6:30 p.m.
Evansville is hosting the Regional Neighborhood Network Conference in 2017! This is the first time since 2003 and a great boost for our community! Senior VP Brent Jackson will be presenting video from past conferences and information on how you can be a conventioneer for FREE ($100 value.) Please plan to attend! 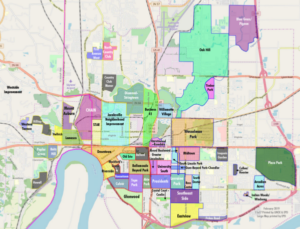 United Neighborhoods of Evansville is made up of autonomous organized neighborhoods working together to preserve, enhance, and promote the Evansville Neighborhoods. 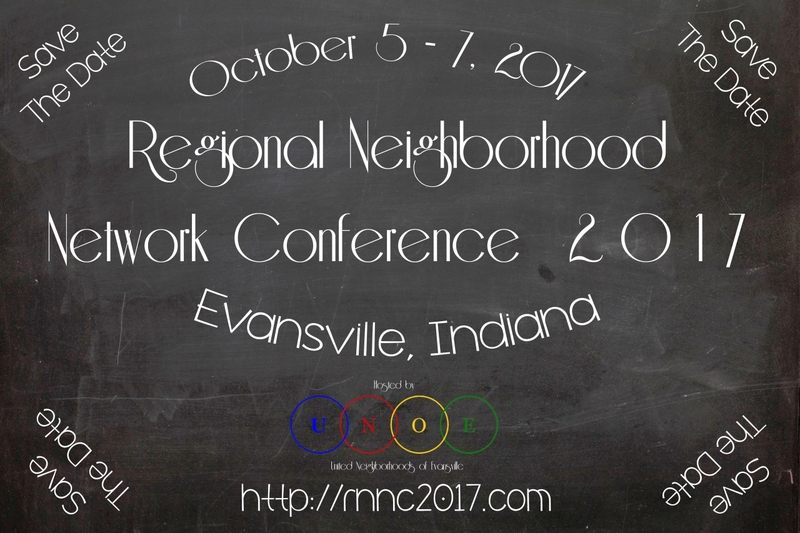 Our focus is on building upon the assets of each neighborhood in order to improve the quality of life for every citizen of Evansville. Our goal is to educate and empower the citizenry to determine their destiny by working in concert with the social and political entities within the greater community to achieve the type of neighborhood environment necessary for quality living. 812-428-4243 if you have any questions. The next United Neighborhoods of Evansville General Membership Meeting will be on Thursday, May 26th 2016 at 6:30 p.m.
At our April meeting, via a vote by the Board of Directors of United Neighborhoods of Evansville, we would like to express our strong support for Ordinance G-2016-10 an Ordinance Amending Chapter 9.20 (Prohibiting the use of Property for Illegal and Nuisance Activity) of The Code of Ordinances. 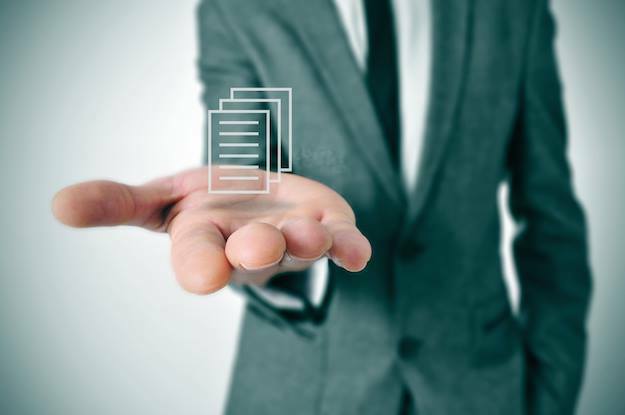 On April 4th, the US Department of Housing and Urban Development sent out a memo on the application of Fair Housing Act Standards to the use of criminal records by the providers of housing and real estate related transactions. Simply put this action has caused our city’s Good Neighbor Ordinance to be outdated and in need of change in order to keep the city from being exposed to potential liability going forward. For months, a diverse made up of Apartment Associations, Property Managers and Owners, Neighborhoods, Law Enforcement, Elected Officials as well as several other interested parties have been meeting going back to November 2015. United Neighborhoods of Evansville has been a part of this group that was formed to discuss updating this local ordinance in order to both refine and improve its effectiveness. Through many meetings and discussions since that time, a refined and updated amendment in line with HUD guidelines is what you now have in front of you for approval. This update includes additional protections for victims of reported incidents of domestic violence that were not present within the original one 15 months ago. We are extremely grateful for the positive community changes that this Ordinance has brought. The City of Evansville has been a leader on this issue and many other communities statewide have reached out to our leadership in order to draft similar ordinances in their own areas. We recommend that Ordinance G-2016-10 move forward when it comes up to a vote. If I may be of any other assistance, please contact me, Chris Cooke, President of United Neighborhoods of Evansville, on behalf of our board of directors at 812-428-4243.
will be on Thursday, April 28th 2016 at 6:30 p.m.
at the CK Newsome Center. 5:30-6:30 p.m. – Mobile Unit will be out front of the Newsome Center for people to tour before the meeting! Please contact the United Neighborhoods office at 812-428-4243 if you have any questions.